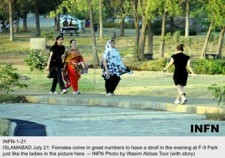 ISLAMABAD July 21, 2010: Being the largest in the capital, the Fatima Jinnah Park is assumed to be the best facilitated park in Islamabad. Yet, regular visitors to the park believe that the humongous facility is beset with numerous grey areas which the city’s managers need to work upon. Despite all development, young people are unhappy as they have no place to play in the park. “We want to play soccer but we are not allowed. The park has so many spacious grounds but every type of sports activity is banned by the park administration,” said Fahad Bin Ameen, a teenager, holding a football in his hands. Alina Ashraf, a university student, believes that the walking track should be recarpeted as it has been damaged. “The main drawback of the park is that there is no refreshment facility for middle class visitors. I think there should be tuck shops, which are a basic requirement of all resorts,” said Usama Hanif, a resident of Sector F-10.” “The administration should plant more trees and there should be proper lights for those who visit the park after sunset. At present, there are very few lights along the walking tracks, posing a problem for the elderly in particular,” he added. “Many boys come here only to irritate females. It is, therefore, essential to have an appropriate security system to keep a check on such activities,” said Zara Jamal, a regular visitor of the park. In contrast to the majority, a few people expressed satisfaction with the facilities. “Although construction work is progressing in some parts of the park, I don’t think it is creating problems for visitors. I am serving in the Prime Minister’ Secretariat as a joint secretary and whenever I find some spare time, I come to the park. It is perfectly alright,” said Ilyas Khan, as he jogged his way forward.